An effort to engage boys in their own happy, healthy growth and development. This year marks the 6th annual "Grow Boys" conference event. In our first year we referred to the event as the "Grow Boys Conference," but decided ever since to refer to it as the "Knights in Training Conference." The rationale was good... we adopted a theme that framed our boys as traveling on a journey of discover surrounding a central them of hope, and that set them up to expand their understanding of four elements: respect; understanding; relationships and responsibility. We also wanted to separate the branding of "Grow Boys" from the conference event so decided a different, unique name would do that. We had other plans for Grow Boys Red Deer as an overarching effort to support the happy, healthy development of boys from birth to 100 and beyond. Now we feel that a retunr to our roots makes sense; it just feels like the right thing to do. So here we are, right back where we started with the Grow Boys conference... we most definitely remain grounded in our Hope Wheel philosophy, and use the teachings of this medicine wheel to frame our day. We do this in honor of the Treaty 6 First Nations that traditionally inhabit this land we live on north of the Red Deer River. As explained so eloquently by Dr. Lorna Williams here, we honor these indigenous peoples and the ways in which they learned and passed on wisdom to their younger generations, just as we intend to do at our conference. Teaching within the culture of the Hope Wheel, we intend to help our boys realize that there is much to experience on their personal learning journeys, and more importantly, that there are many surrounding them willing to help them as they grow and learn. 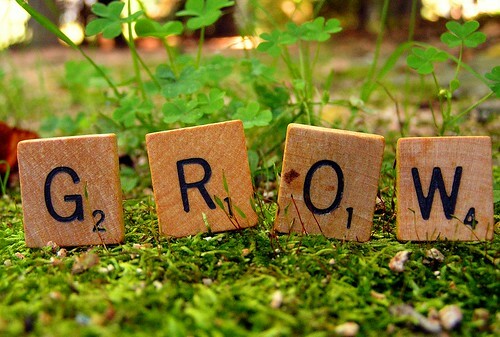 That is the spirit of Grow Boys, and whey we continue to make the effort each spring. Many, many thanks to all of our collaborators, volunteers, mentors, presenters, teachers and other supporters who together, create the network of kind and caring people who support our fifth grade boys authentically and enthusiastically. 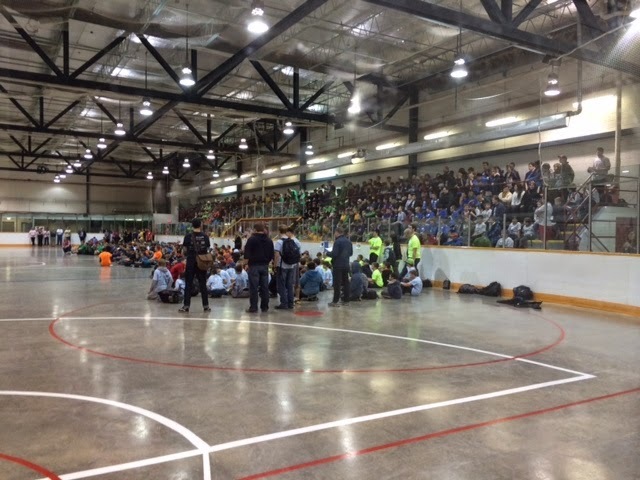 Last May Grow Boys Red Deer hosted it's fourth annual Knights in Training Conference (KIT) for over 700 fifth grade boys from our community schools, our largest group yet. We have grown in numbers each of the four years we've hosted KIT, and for the past two years we're proud to say we hosted every single school from both Red Deer Public Schools and Red Deer Catholic Schools that teaches fifth grade boys. We have grown in so may ways since our humble beginnings as nothing more than an idea to support boys growing up in what can be a challenging world. We strongly believe we are still on the right track with this mandate, and developments have occurred since we started with the idea that make it even more relevant and sustainable, but in order for that to happen we need to reflect and strategize proactively. This post is a state of the union so to speak, about where Grow Boys Red Deer is today, and where we think we need to grow from here to ensure we are continuing to support the happy, healthy growth and development of boys in our community. The statements that follow, like everything we do needs to be grounded in collaborative dialog in order for the best possible path to be realized forward. It's not a report card. It is a hopeful set of statements regarding where we strongly feel Grow Boys Red Deer needs to take action to continue moving toward our mission and vision. Grow Boys is not the Knights in Training Conference (KIT), and the Knights in Training Conference is not Grow Boys. Grow Boys plans and hosts KIT. It is simply one of our projects, and we need to pursue other projects that will help represent our mission and vision. We need to expand our base of support within our community to enable other creative and supportive people to work with boys and men of all ages so they may be happy, healthy and well adjusted members of the community. Our Mission is to…provide opportunities for local boys to discover, improve and share their skills in a variety of contexts. Our Vision is… A society where the unique social, emotional, physical and psychological needs of boys are supported without bias or stereotype. We believe strongly that self esteem is tied to learning. Helping boys of all ages discover and improve their unique abilities is the way we support and enable their learning. Providing opportunities for boys of all ages to share their unique abilities is the second element of our mission, and the way we help them grow positive images of themselves. We believe that boys who feel good about themselves are better prepared to continue learning without extraneous stress and anxiety, which in turn allows them to grow happily and in healthy ways so they in turn can support others as they have been supported. This is the process of actionable hope; the element that Grow Boys Red Deer is founded on. The Hope Wheel is a visual representation of our mission and vision. We subscribe to a circular or concentric view of human development and everything we do follows this path. 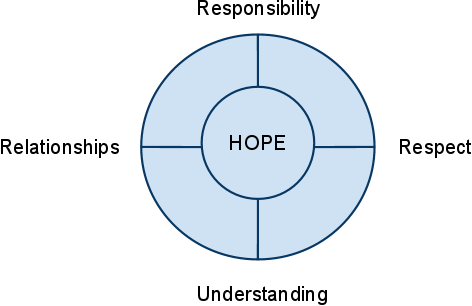 The journey of the Hope Wheel is one of learning and growth, and can apply to any circumstance where learning and growth are possible. Beginning with respect, the Hope Wheel starts in a context of newness; infancy. Here in the domain of infancy all is new and all is possible with a little support and a purpose driven perspective. Respect- Respect is a curious element… we know it when we see it, but it’s a hard thing to explain. 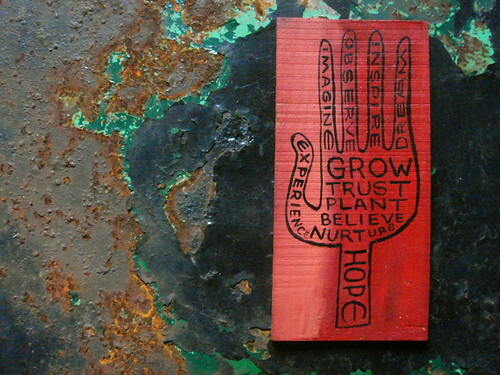 On our Hope Circle, respect is the phase of dependence. It’s up to us to provide context for young boys regarding what it is we want them to learn, and how we want them to grow. We’re framing respect as purpose. Before we can develop skills and perspectives, we need purpose. We have to know why we are doing something before we can learn how. The domain of respect is where we establish purpose; the place where we answer the question, “why?” Sessions that represent the domain of respect at KIT are presented in the spirit of answering "why?" and framing purpose through being a good student; someone who respects the teacher and the learning process, no matter who that person is or what the topic is. Understanding- Understanding is the domain where we begin to explore the concept of independence, the domain of the young child. Once we have purpose, we can move away from the sheltered phase of dependence to explore the world more confidently and purposefully. Stable and confident young men feel safe breaking away from the dependent phase if we've done a good job supporting them with purpose; the implicit sense that they belong to something much larger than themselves, something good… a secure base. Sessions that focus on understanding are those that require a bit of calculated risk; to try something new and to become committed to whatever outcome occurs, self reflect on that and perhaps try again without fear of making a mistake. Relationships- This is the domain of interdependence, also referred to as the domain of the adult. In the Relationships domain, young men begin to understand the enabling power of belonging to a network- a cohort of significant others who support them and help strengthen their secure base. Learning how to communicate meaningfully and honestly in the Relationships phase teaches our boys how to seek help when they need it and not take on the weight of the world alone. We offer sessions to specifically address this direction. Throughout the day as the boys travel with a new group of kids most of which they don't know ahead of time, they learn about relationships through having to build them... talk to others, get to know them. The process is somewhat daunting for many, but that doesn't make it negative. Responsibility- The domain of Responsibility is the place boys arrive at where they feel compelled to share their knowledge, skills and perspectives with others. This is the domain of maintenance meaning they are now elders; those “who know,” and as those who have already traveled the path they have a responsibility to nurture those who have yet to experience the journey. As those who know, they become part of the secure base for others who are finding their place on the Hope Circle. Our high school volunteers act in the role of elders as they guide each clan group throughout the day during KIT. Sessions that address this domain touch on big topics like our refugee camp session where the boys learn what it's like to live in a refugee camp, and why society needs to take care of displaced people in need. In order for Grow Boys to further our efforts in support of boys and men of all ages, we need to help people understand this background to what we do, and why we want to do it. Ours is not simply an effort to give the boys something to do on the same day that Go Girls is taking place. It is most definitely an effort to explicitly teach and support the four directions mentioned above in support of happy, healthy growth and development. The mandate to host KIT was born out of the desire to support boys within our community, and the idea resulted from a grassroots meeting that took place five and a half years ago. 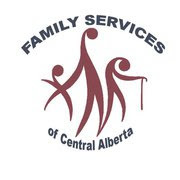 Invited members at this meeting represented many different aspects of support within Red Deer, and all agreed that boys are growing up in a challenging world these days, and could use our support. This meeting saw the beginnings of Grow Boys as a concept begin to take shape, and it also hatched the idea of an annual conference to support what would become our mission and vision. As it turned out, the desire of school based administrators back in the early days of planning KIT was to host the conference on the same day as Go Girl, a preexisting event that addresses health/wellness and physical literacy issues confronting girls at the fifth grade level. We had already decided to host fifth grade boys at KIT owing to the fact that this is the last year of elementary school within our community and pre-adolescent boys are about to enter an entirely new stage of learning and development in middle school. It seemed natural to start with this age group, and then expand our reach as time went on to work with boys and men of all ages. We did feel at the time, and still do, that our KIT conference would be more relevant if held in the fall of each school year. This is something we will need to talk about in depth moving forward. We have great respect for what Go Girls does each year, but their's is a different kind of conference targeting a very different and specific mandate to get girls moving and thinking about their personal health and wellness. We have been characterized as the male version of Go Girls, and this could not be further from the truth. Our conference context is very different. Our focus surrounds the concept of hope framed as action in multiple domains of respect, understanding, relationships and responsibility. We intend to teach boys at KIT how to take action and be bold about trying new things that may ultimately lead to a long term commitment to an activity that helps them feel good about themselves and to share that feeling with others in any combination of social, emotional, cognitive and/or physical contexts. Boys experience just as many challenges to their growth and development as girls do, and need our help to navigate the pitfalls and barriers they encounter. Our framework in the Hope Wheel provides a secure base to work from in providing this help. It's folly to make such misinformed and stereotypical statements about boys like, "if we could just give boys more opportunities to be active more often they'd be much more focused and subdued and in turn will be able to learn better," or "boys just aren't into school like girls are." If it were that simple, and if as we speak we were doing everything right to support boys, why do they continue to experience problems? Boys are emotional beings. They have feelings, anxieties, struggles and disappointments like every other human being. Most importantly, each one of them is unique and needs to be recognized for the positive elements he brings with him to school every day. By mixing up the boys from different schools, including the high school mentors who facilitate our conference, we are gently encouraging them to be social; to step outside their circle of regular friends and stretch their comfort zone, meet new people, share experiences with them. Is this a tad bit disruptive? Yes... all effective learning is. By providing session experiences touching on each of the 4 domains of the Hope Wheel, we intend for each boy at the conference to begin to understand why these elements are important in learning and life. 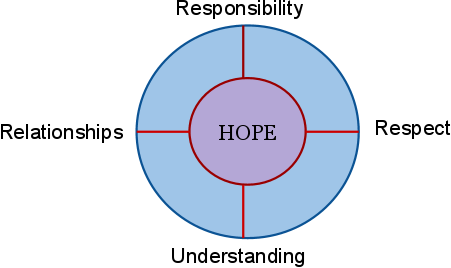 Every participant attends four unique and engaging sessions, each representing and corresponding to one or more of the 'four directions' as we call the domains of the Hope Wheel. By soliciting the help of high school boys as mentors and facilitators during the conference we illustrate for the younger boys that giving back is a cool and good thing. The older boys share their insights about middle school and high school, and they report getting as much out of the volunteer experience as the younger boys do. This will be the first year that our high school boys will have participated as 5th grade boys in the first year of our event, which is pretty great. We expose the boys to unique sessions that are not readily available to many of them in the community, and that teach them about deep contexts and domains like empathy, effort, commitment, support for others, challenge, goal setting, emotions and more. 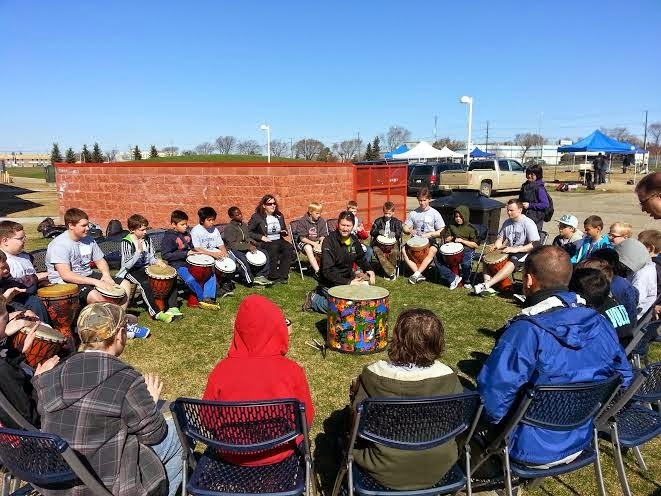 We include fun, 'come try it out' sessions like archery, skateboarding, drumming, hip hop dancing etc. and we offer an opportunity to meet folks from all walks of life in the 'Living Library.' Each participant leaves at the end of the day having been exposed to so much rich experience and knowledge enabled by passionate adults who want to share their experiences and skills with them... something we hope each of them are grateful for. We could go on, but the best way to realize how much learning occurs at KIT is to come to the event. We have hosted many over the years, and all have been impressed with the levels of engagement and activity. There is so much to know, to do, to be and to live in a young boy's life at home, in school and in the community. 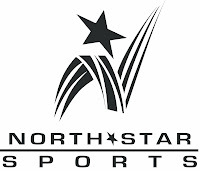 Our event is nothing if it isn't simply an effort by a whole whack of solid, responsible and caring adults to lighten the load a bit for our boys as they grow to become happy, healthy well adjusted young men in society. The film hasn't been released yet, but as soon as it is I plan to screen it at my school for parents, staff and students and I intend also to use the educational material offered as well. There is another film called MISREPRESENTATION that I also intend to purchase and use to work with the same groups. This material is really good stuff. THE MASK YOU LIVE IN frames the reason why our diverse group of engaged adults got together back in 2011, and we believe strongly that we need to continue our work but (surprisingly to us since the beginning) we have not been immune from detractors. This is what I want to talk a bit about. To state the obvious, there is controversy that runs along gender identity lines. No matter what side of this controversy you fall, it would be difficult to justify that it manifests in any good way for any particular individual, male or female, who is struggling through a personal search for identity. How we choose to represent ourselves to the world is a deeply personal decision, one that should be honored and respected. But often it isn't. Expectations, perceived or real, of what we think we should represent will either allow or prevent us from being true to ourselves. No matter what we decide to represent, judgment seems to rear its ugly head and we are then forced to consider our choice with acceptance or not. But what if we didn't have to do that? What if the world respected each of our decisions to be what we felt natural being; to be what we wanted to be and represent what we wanted to represent without having judgement passed upon us? As a young boy and into adulthood, I've been judged by the way I have chosen to represent myself to the world...actually a more accurate word would be misjudged. 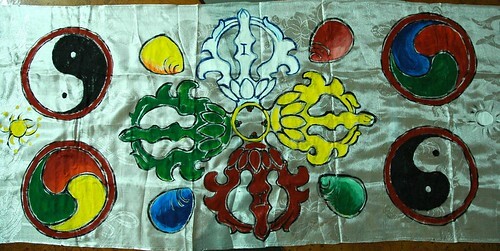 I have learned how to recognize this and I try to make adjustments, but I cannot tell you there hasn't been a struggle. If we could reduce or remove the struggle also known as stress, anxiety, diminished self-worth, fear, intimidation and a litany of other debilitating factors associated with this judgment, why would we not do that? This is what Grow Boys aims to do for boys of all ages. Feminine traits are ways of behaving that our culture usually associates with being a girl or woman. Masculine traits are ways of behaving that our culture usually associates with being a boy or man. Clearly, society’s categories for what is masculine and feminine are unrealistic. They may not capture how we truly feel, how we behave, or how we define ourselves. All men have some so-called feminine traits, and all women have some so-called masculine traits. And we may show different traits at different times. Our cultures teach women and men to be the opposite of each other in many ways. The truth is that we are more alike than different. We (Grow Boys) have been challenged by people who interpret gender stereotypes in particular ways. We have been asked why we believe we need to support boys because boys "will be just fine; they will fight it out or deal with things and move on... they're tough" they say. Enter debilitating stereotype example #1. We have been asked why we have so many women working with us to support Grow Boys because boys "really need men to show them how to become masculine and strong... how to be good men" they say. Enter debilitating stereotype example #2. We have been asked why we don't just provide more opportunity for boys to get active and move around because boys "need to be moving; they are kinetic and can't sit still... they just need to have more action" they say. Enter debilitating stereotype example # 3. I could go on. The fact of the matter is we have established a set of criteria that we assert defines a typical boy... the film trailer above addresses this so well. But what of the boys who do not fit the bill, those who are perhaps more sensitive, less rambunctious, inclined more toward being less impulsive and more thoughtful? I am going to say that these boys are not the minority as is so popularly stated. I am going to say even that the term 'gender atypical' used to describe these boys is unfair and inaccurate as it relates to anything other than cultural norms or expectations of what a man or woman 'should' look, sound and act like. We tell them what a man looks like, sounds like and acts like, and then we judge them based on how closely they conform to this standard. This is really tough for so many boys who are trying to grow up and be accepted for who they really are and want to be more of. I can't tell you how many times I've sat in a dressing room after a fight during a hockey game where one of my team mates was going through a really tough moment trying to deal with the emotions that go with fighting when one doesn't really want to... I've been there as the combatant myself. I've seen grown men cry or even vomit following an on-ice brawl because they were so uncomfortable in that role as hockey fighter, but felt pressured to be that guy, the "goon" as they say. These guys are among the toughest men I've known, and some of them cried or vomited as a result of the pressure they felt to "be a man." Even the toughest, most resilient men among us have feelings and emotions that tend toward the feminine side of the scale more than the masculine. So how do we help all boys and men feel more at ease with themselves, and more confident to represent themselves without fear of judgement or pressure to be 'someone else'? I think the answer is found by steering clear of expectations of being 'typically male' or being 'typically female' and approaching it more from a context considering the masculine and feminine perspective. Instead of expecting our boys to be as close to our cultural defined ideals of a 'typical man', I suggest that each of us as males have some part, a lot or a little that could be described as our feminine side, and some part, a lot or a little that could be described as our masculine side. To me, the closer a guy of any age can get to a balance between the two sides the better. Men and women are different, of that there is no doubt, but men who have a greater ability to identify with both a masculine and feminine perspective hold a gift that allows them to see things differently when necessary, and deal with people more effectively and with greater understanding. This belief also explains in part why so many women are doing great things working with boys of all ages... and why we have so many effective and understanding women working with Grow Boys. These women are those that have an obvious tendency to understand a masculine perspective as well perhaps as they do a feminine perspective. They see things in a balanced way. They combine or leverage a masculine or feminine perspective as necessary to communicate more effectively and understand people more effectively. How well either males or females see and interpret both perspectives in an integrative and purposeful way considering the context of situations, interactions, challenges, relationships etc. should be the socially accepted standard for males and females that we judge to determine the character quality of an individual, not how close one is to being a culturally stereotyped man or a culturally stereotyped woman. … A society where the unique social, emotional, physical and psychological needs of boys are supported without bias or stereotype. We believe that there are all kinds of boys out there, each worthy of acceptance. The way we choose to accept them is to honor and respect their unique qualities of character. We also choose to accept the choices they make with respect to what they do, feel and say. We intend to validate these choices and help provide outlets for them to express themselves freely without anxiety to measure up to a culturally defined standard of high quality 'male-ness' that some will continue to expect from them. We understand that there are boys who will epitomize the cultural standard of stereotyped masculinity, and we honor and respect them too... we understand more than anything that every boy no matter where they fall on the spectrum of more masculine or more feminine in their unique perspective needs our support to grow up as a healthy, happy and well adjusted man. He will in turn treat his sons and other boys he encounters with respect and honor validating their unique perspective and helping them feel purposeful and happy. In the beginning when Grow Boys was nothing more than a conceptual idea, a breakfast meeting took place at the Botanica Restaurant inside Red Deer Lodge. I was there with Bruce Buruma, Executive Director of The Foundation for Red Deer Public Schools and two Directors of their Board. We shared breakfast and thoughts about what could become of Grow Boys Red Deer, and how the Foundation could support the effort. The rest, as they say, is history. The Foundation for Red Deer Public Schools became the first philosophical and financial supporter of Grow Boys Red Deer. The Foundation is now in its third year of financial support of what we do, and we wouldn't be able to do it without them. The Foundation has been right there with us all along. We want to express our sincere thanks. In addition to Grow Boys and our annual Knights in Training Conference, the Foundation supports many other worthy and important projects designed to support kids in their learning journey. 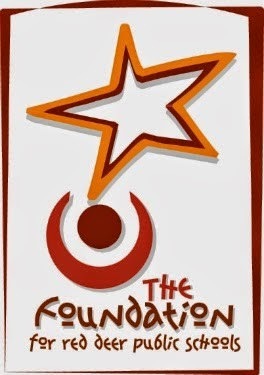 The Foundation's mission, vision and values exemplify what they stand for and support. We truly appreciate the Foundation's perspective and effort to support kids from kindergarten to grade twelve within our community and school district. The Foundation for Red Deer Public Schools support of Grow Boys Red Deer has been a catalyst for others to join in to support what we do. Following suit with The Foundation for Red Deer Public Schools, the Red Deer Regional Catholic Education Foundation joined in with funds in support of our first Knights in Training Conference, and they continue to support our organization each year. 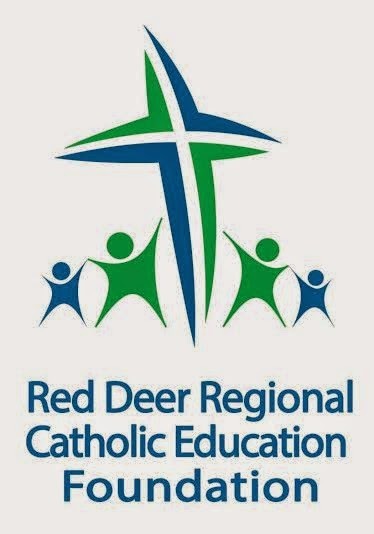 Grow Boys Red Deer would like to extend a sincere thanks to the Red Deer Regional Catholic Education Foundation for what they do and for their ongoing support of what we do. We hope to see representatives of both Foundations at the 2014 Knights in Training Conference on May 7 at the G.H. Dawe Community Center in Red Der, AB. Here We Grow Once Again! We have a date! The third annual Knights in Training Conference for fifth grade boys in Red Deer, AB, Canada is set to go on May 7, 2014 at the beautiful G.H. Dawe Community Center in the north west side of town. We have big plans this year, lots of engaging sessions planned and a new home base for the boys at our venue. With the support of our many sponsors we know this year's event will be the best ever! Right up front we want to acknowledge our many sponsors who help make our event possible. You are the people and organizations that share your passion to help our boys to imagine possibility, dream big dreams and take action toward hope for their futures... and ours too. Thanks to all of you, and we hope you can join us on May 7th. We really appreciate what you do, and are thrilled when you can represent at Knights in Training in person. Many thanks to you all! Prairie Bus Lines Jumps on Board!